The edge deflection for a 36" Dial Table was estimated for both the Carbon dial table and an aluminum dial table. Edge deflection was estimated for total tool loads of 28, 57 and 113lbs. A 36" diameter dial table is traditionally manufactured from 1" thick Mic6 aluminum, so the carbon dial table was compared directly with this product. 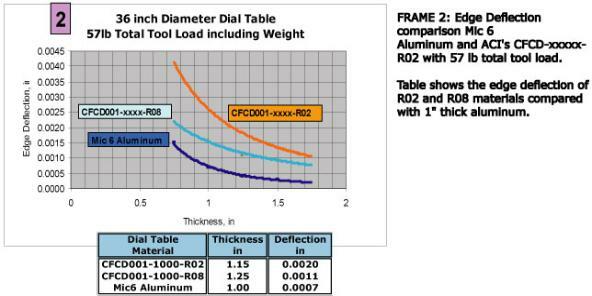 FRAMES 1, 2 and 3 show the edge deflection of a BCDT-03600A Carbon Dial Table manufactured from illstreet's CFCD-xxxx-R02, R04, R08 and R012 materials compared to aluminum for varying tool loads.